Below, you'll find free eBooks formatted in PDF and .mobi file formats to work with your PC, iPad, Kindle, smartphone, and other devices. These books are offered under a Creative Commons license (see copyright notice in each book). Please share these eBooks with a friend. Many have noted the apparent similarities between the horror fiction of 1930s writer H. P. Lovecraft and the ancient astronaut theories promoted in the work of Erich von Daniken and the History Channel's Ancient Aliens series. 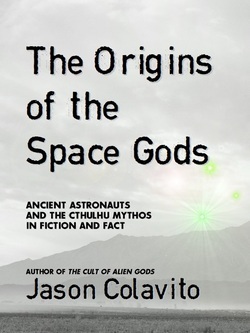 In 2005, Jason Colavito's The Cult of Alien Gods proved that the ancient astronaut theory originated in Lovecraft's horror fiction, the so-called "Cthulhu Mythos." 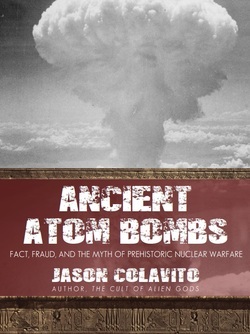 Now, Colavito presents a new, updated summary of the path from Lovecraft's fiction to the History Channel's "fact" in this brief, illustrated ebook that asks the question: Ancient astronauts--fact or fiction? This free 30-page eBook is available for download as a full-color, fully-illustrated formatted PDF file, or as an illustrated .mobi file for the Amazon Kindle and smartphones. Errata: In the book Lord Pacal of Palenque is mistakenly misidentified as "Palenque." The corrected text of this eBook can be found here. Ancient Greece looms large in the modern imagination as the font of Western civilization. Because Greek accomplishments are so fundamental to the Western world, there has been no shortage of attempts to rewrite the history and mythology of ancient Greece to suit modern ends. This book will examine Robert Freund's recent claim to have discovered Atlantis in Spain and discuss the real evidence needed to prove Atlantis existed outside Plato's imagination. This book will also explore attempts to link Atlantis with creationist and catastrophist theories of history and one scholar's belief that the ancient Greeks had modern robotic technology. 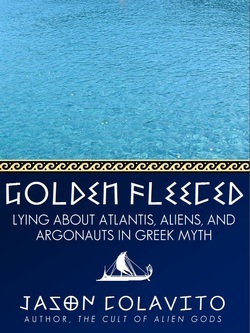 Finally, this book will explore the misuse of the Greek myth of Jason and the Argonauts in Robert Temple's theory that amphibious aliens from Sirius invented human civilization. Greek mythology is a source of endless fascination. This brief eBook looks at four ways this fascination went very, very wrong. Ever since Christopher Columbus landed in the New World in 1492, claims have arisen that other people (besides the Native Americans, of course) arrived first. Science tells us that at least one of these claims, that of the Vikings around 1000 CE, is true. But nearly every ancient people of the Old World has been proposed as a possible visitor to ancient America and originator of its many native cultures. 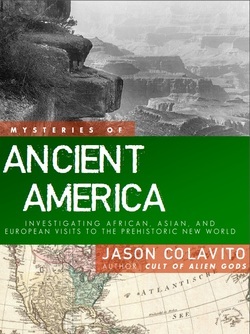 This eBook investigates four theories about ancient visitors to North America: Did prehistoric Spaniards bring the first stone tools? Did an Egyptian colony live in the Grand Canyon? Did Chinese voyagers beat Columbus to America? And what was the true origin of the Maya—African, Asian, Atlantean, or space alien? This is the eBook that asks the question: Who really discovered America? This free 50-page eBook is available for download as a formatted PDF file, or as a .mobi file for the Amazon Kindle and smartphones. For nearly three centuries, the horror genre has offered a running commentary on the role of science in our society. Whether this takes the form of mad scientists like Victor Frankenstein or Dr. Moreau or unclassifiable monsters that defy human reason like Ambrose Bierce’s Damned Thing or the extraterrestrial blasphemies of H. P. Lovecraft, horror stories show us that the light of knowledge does not always illuminate the darkest corners of our world, or our souls. 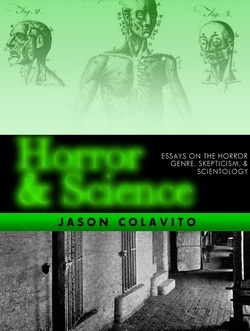 This collection of essays examines some of the odder corners of the intersection of reason and fear, including professional skeptics who condemn horror fiction as dangerous, radical theorists who misused horror ideas to claim aliens visited the ancient earth, and the thematic connections between H. P. Lovecraft’s ancient extraterrestrial gods and the cosmology of Scientology. This free 40-page eBook is available for download as a formatted PDF file, or as a .mobi file for the Amazon Kindle and smartphones.